It’s hardly news to anyone who follows cyberthreat intelligence that the Lazarus APT group targets financial entities, especially cryptocurrency exchanges. Financial gain remains one of the main goals for Lazarus, with its tactics, techniques, and procedures constantly evolving to avoid detection. In the middle of 2018, we published our Operation Applejeus research, which highlighted Lazarus’s focus on cryptocurrency exchanges utilizing a fake company with a backdoored product aimed at cryptocurrency businesses. One of the key findings was the group’s new ability to target macOS. Since then Lazarus has been busy expanding its operations for the platform. Further tracking of their activities targeting the financial sector enabled us to discover a new operation, active since at least November 2018, which utilizes PowerShell to control Windows systems and macOS malware for Apple users. Lazarus uses different tactics to run its C2 servers: from purchasing servers to using hacked ones. We have seen some legitimate-looking servers that are most likely compromised and used in malicious campaigns. According to server response headers, they are most likely running an old vulnerable instance of Internet Information Services (IIS) 6.0 on Microsoft Windows Server 2003. Another C2 server was probably purchased by Lazarus from a hosting company and used to host macOS and Windows payloads. The geography of the servers varies, from China to the European Union. But why use two different types of servers? The group seems to have a rule (at least in this campaign) to only host malware on rented servers, while hosting C2 scripts for malware communication on compromised servers. 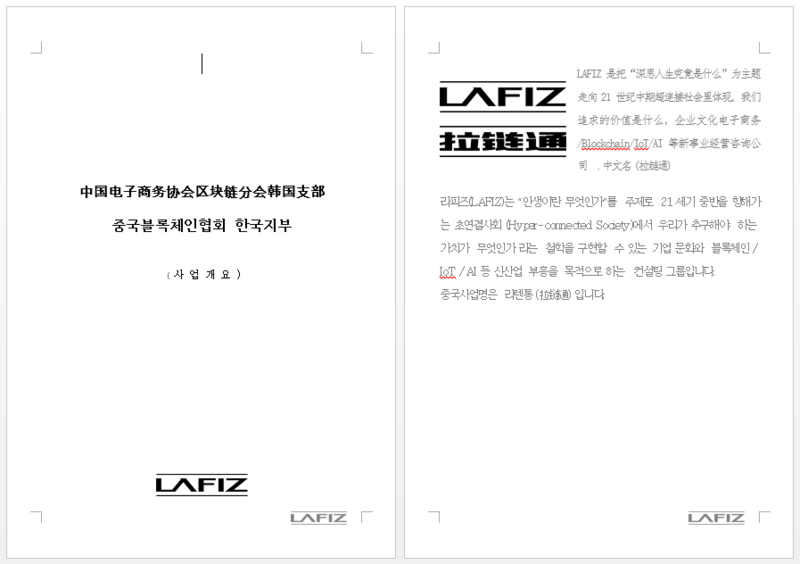 Another macro-weaponized document (e9a6a945803722be1556fd120ee81199) contains a business overview of what seems to be a Chinese technology consulting group named LAFIZ. We couldn’t confirm if it’s a legitimate business or another fake company made up by Lazarus. Their website lafiz[. ]link has been parked since 2017. The payloads show that Lazarus keeps exploring more ways to evade detection to stay under the radar longer. The group builds malware for 32-bit and 64-bit Windows separately to support both platforms and have more variety in terms of compiled code. The Windows payloads distributed from the server (nzssdm[. ]com) hosting the Mac malware have a CheckSelf export function, and one of them (668d5b5761755c9d061da74cb21a8b75) has the internal name ‘battle64.dll’. 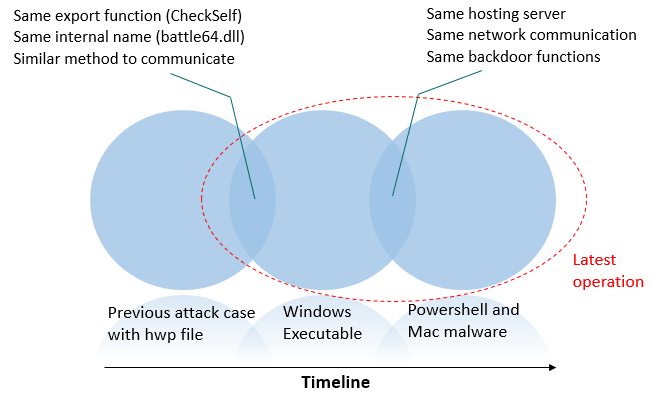 From that point we managed to find additional Windows malware samples containing the CheckSelf export function and an internal name containing the word ‘battle’. 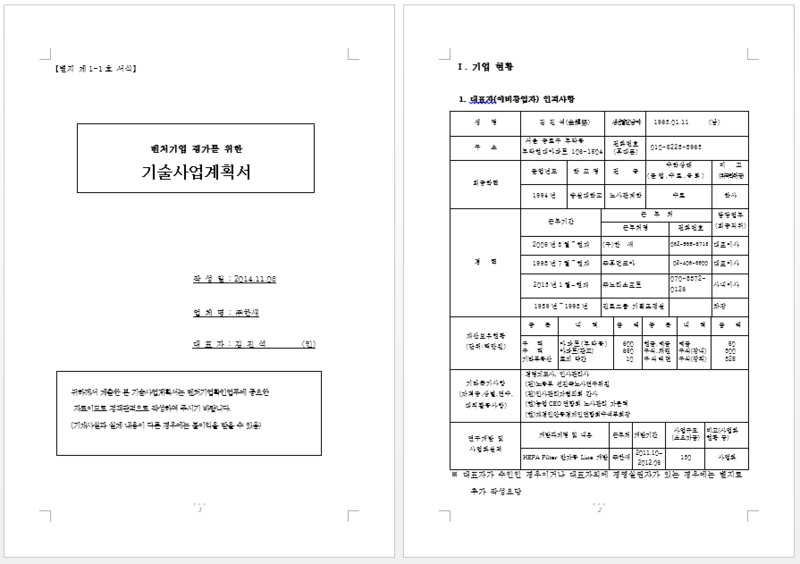 These Windows malware samples were delivered using malicious HWP (Korean Hangul Word Processor format) documents exploiting a known PostScript vulnerability. It should be noted that HWP documents are only popular among Korean users (Hangul Word Processor was developed in South Korea) and we have witnessed several attacks using the same method. It’s no secret that Apple products are now very popular among successful internet startups and fintech companies, and this is why the malicious actor built and used macOS malware. While investigating earlier Lazarus incidents, we anticipated this actor would eventually expand its attacks to macOS. It appears that Lazarus is using the same developers to expand to other platforms, because some of the features have remained consistent as its malware evolves. We’d therefore like to ask Windows and macOS users to be more cautious and not fall victim to Lazarus. If you’re part of the booming cryptocurrency or technological startup industry, exercise extra caution when dealing with new third parties or installing software on your systems. It’s best to check new software with an antivirus or at least use popular free virus-scanning services such as VirusTotal. And never ‘Enable Content’ (macro scripting) in Microsoft Office documents received from new or untrusted sources. Avoid being infected by fake or backdoored software from Lazarus – if you need to try out new applications, it’s better do so offline or on an isolated network virtual machine which you can erase with a few clicks. We’ll continue posting on Lazarus’s latest tactics and tricks in our blog. In the meantime, stay safe! For more details on this and other research, please contact intelreports@kaspersky.com. e6d5363091e63e35490ad2d76b72e851 test.ps1 – It does not contain URLs. What were the most interesting developments in terms of APT activity throughout the year and what can we learn from them? Not an easy question to answer; everybody has partial visibility and it’s never possible to really understand the motivations of some attacks or the developments behind them. Still, with the benefit of hindsight, let’s try to approach the problem from different angles to get a better understanding of what went on. There are a few ‘traditional’ actors that are very well known to the security community and that everybody has been tracking for the last few years. It has been business as usual for these actors in 2018 or, if anything, perhaps slightly quieter than usual. In reality, it is the doctrines and modi operandi of these groups that determine how they react in the event of their operations becoming public knowledge. Some actors will simply abort their campaign and go into clean-up mode, while others carry on as normal. In order to do so, it is common for some of these actors to simultaneously work on several sets of activity. This allows them to compartmentalize operations, and if they are discovered, they simply improve their toolset to avoid detection next time. We traditionally find many Russian-speaking actors in this second group, and we would like to highlight the 2018 activity of Sofacy, Turla and CozyBear. Sofacy was probably the most active of the three. Throughout the year we detected it in various operations, updating their toolset and being blamed by authorities for several past operations. We have seen the actor deploying Gamefish and an updated version of its DealersChoice framework against embassies and EU agencies. One of the most high-profile incidents was abuse of Computrace LoJack by this actor in order to deploy its malware on victim machines, in what can be considered a UEFI-type rootkit. Zebrocy is one of the tools traditionally used by this actor, but in reality the collection of cases where this tool was used can be considered a subset of activity in its own right. We saw different improvements for Zebrocy’s subset, including a new custom collector/downloader, new VBA implementing anti-sandboxing techniques and new .NET modules. During the year we understood that Sofacy appears to be changing at a structural level and is possibly already being split into different subgroups. With the OlympicDestroyer analysis we learnt that this highly sophisticated false flag operation was somehow related to Sofacy. However, we later observed more activity by the OlympicDestroyer subset in Europe and Ukraine, and it was then that we decided to treat it as the entity we call Hades. Of particular interest is how, after the publication of the GreyEnergy set of activity that is believed to be a continuation of BlackEnergy/Sandworm, we found additional overlaps between GreyEnergy and Zebrocy, including the use of the same infrastructure and the same 0-day for ICS. All that seems to link this new Hades actor with the Zebrocy subset of activity, traditionally attributed to Sofacy, as well as part of the BlackEnergy/GreyEnergy/Sandworm cluster. Regarding Turla, we didn’t spot any big structural changes like those described above, though we did see this actor using some interesting implants such as LightNeuron (targeting Exchange servers as described in our previous APT summary for Q2), as well as a new backdoor that, according to ESET, infected Germany’s Federal Foreign Office in 2017, as well as other entities in the European Union. We discovered this actor using a new variant of its Carbon malware in its traditional activity of targeting embassies and foreign affairs institutions throughout the year. It also started using a new framework that we call Phoenix, as well as (unsurprisingly) transitioning to scripting and open source tools for its lateral movement stage. Finally, some potential CozyDuke activity was detected during November 2018, apparently targeting diplomatic and governmental entities in Europe. The TTPs do not seem to be those that are usually attributed to this actor, which opened the door to speculation about this malware being used by a different group. The facts still seem to confirm that the malware used is attributable to CozyDuke. We are still investigating this new campaign by an actor that has been inactive for months. It’s also worth mentioning Lazarus and BlueNoroff activity in 2018. We observed constant activity from this group targeting different regions including Turkey, other parts of Asia and Latin America, as well as various lines of business that provide it with financial gain, such as casinos, financial institutions and cryptocurrencies. In its more recent campaigns it has started deploying a new malware we call ThreatNeedle. It comes as no surprise to find false flags every now and again, sometimes implemented rather naively. But this year we witnessed what should be considered (so far) the mother of all false flags (more details can be found here). Other than the technical details themselves, what is also worth considering is the real purpose of this attack, and why these sophisticated false flags were planted in the malware. The first obvious conclusion is that attackers now understand very well what techniques are used by the security industry to attribute attacks, so they have abused that knowledge to fool security researchers. Another consideration is that the main objective of an attack is not necessarily related to stealing information or disrupting operations – imitating an attacker might be more important. This may actually be part of what some actors are doing at the moment. There are several groups that were apparently inactive for some time but now appear to be back. However, they are using different TTPs that are not necessarily better. As we shall see later, a couple of examples may be CozyDuke and APT10. As a purely speculative thought, it might be that their traditional toolset is now being used by different groups, maybe still related to the original operators. The purpose might be to make attribution more difficult in the future, or simply to distract from their real ongoing operations. 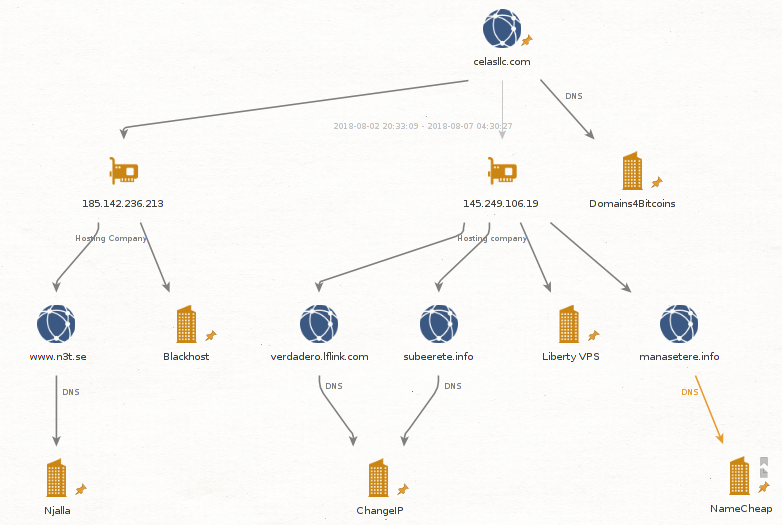 The whole OlympicDestroyer story eventually resulted in the discovery of a new subset of activity related to both Sofacy and BlackEnergy that we call Hades. We will see how these more sophisticated false flags evolve in the future and how they are used to pursue less explicit goals. Throughout the year we also saw how several old ‘friends’ re-emerged from hibernation with new sets of activity. Here we are talking about several well-known actors that for unknown reasons (a lack of visibility might be one of them) didn’t display much activity in recent times. However, it seems they are back. In some cases they appear in different weaker forms, perhaps with different operators, or just pretending not to be in shape while they run other parallel operations; in others cases they are back with their usual capabilities. We can summarize all this by dividing it up into the regions that showed most activity during the year. First place went to South East Asia, followed by the Middle East. For South East Asia we can point to groups such as Kimsuky that developed a brand new toolset at the very beginning of the year, or activity that falls under the always difficult-to-attribute WinNTI ‘umbrella’. However, and most notably, we can highlight groups such as DarkHotel, LuckyMouse, or even APT10. The OceanSalt campaign was attributed to APT10, though it’s not very clear how strong the connection is. It seems unlikely that this actor, after the public disclosure and so many years of no known activity, would return with anything that might be attributable to them. At the moment, this is difficult to assess. LuckyMouse, the second Chinese-speaking group from this list, was very active all year. It hacked national data centers to deploy watering-hole attacks against high-profile victims in central Asia, used a driver signed by a Chinese security-related software developer, and is even suspected of being behind attacks against Oman immediately after the signing of a military agreement with India. Scarcruft used a new backdoor we call PoorWeb, deployed a 0-day in their campaign at the beginning of the year and used Android malware specially designed for Samsung devices. DarkHotel was also back with a 0-day and new activity, targeting their traditional victims. We were able to establish a connection with a medium level of certainty between DarkHotel and the Konni/Nokki set of activity described by other vendors. APT10 was especially active against Japanese victims, with new iterations of its malware, as was OceanLotus, which actively deployed watering holes targeting high-profile victims in South Asia with a new custom stager. 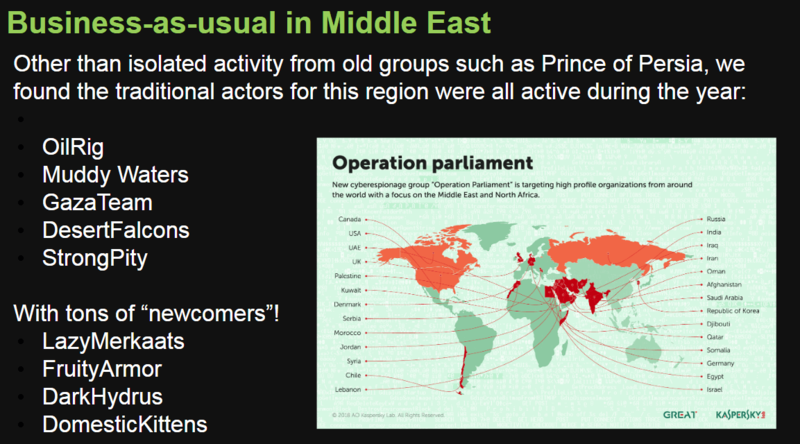 In the Middle East we observed groups such as Prince of Persia re-emerge with some activity, along with OilRig. We also detected new MuddyWaters activity, as well as GazaTeam, DesertFalcons and StrongPity among others deploying various campaigns in the region. At the same time many new sets of activity emerged during the year that were also focused primarily on the Middle East and South East Asia. This activity was driven by Asian actors such as ShaggyPanther, Sidewinder, CardinalLizard, TropicTrooper, DroppingElephant, Rancor, Tick group, NineBlog, Flyfox and CactusPete – all of them active in the region throughout the year. As a rule, these groups are not that technically advanced, using a variety of approaches to achieve their objectives. They are usually interested in regional targets, with their main objectives being governmental and also military. In the Middle East we saw activity by LazyMerkaats, FruityArmor, OpParliament, DarkHydrus and DomesticKitten among others. Sets of activity such as that by the Gorgon group are a bit of an exception as they also target victims outside the region. Finally, we also detected new sets of activity that show an apparent interest in eastern European countries and former Soviet republics. In this group we find DustSquad, ParkingBear and Gallmaker. The latter seems to be interested in overseas embassies as well as military and defense targets in the Middle East. Even if some of the activity previously described doesn’t seem that technically advanced, it doesn’t mean it isn’t effective. Looking back we can cite a few public cases where it looks like these attacks are returning to the days when attackers were after major strategic research or blueprints that might be of the interest to state-sponsored groups, and not just some random data. We have several examples. For instance, APT15 was suspected of targeting a company providing services to military and technology departments of the UK government. Intezer provided extra details about the activity of this group, though it is not clear who the ultimate victim was. TEMP.Periscope was suspected of hacking maritime organizations related to the South China Sea. It wasn’t the only case in which the industry was targeted, as later it was discovered an unknown actor attacked companies related to Italian naval and defense industries. Groups such as Thrip showed a clear interest in targeting satellite communication companies and defense organizations in the US and South East Asia. Finally, the US Naval Undersea Warfare Center was attacked, according to the Washington Post, by a group linked to the Chinese Ministry of State Security, resulting in the theft of 614GB of data and blueprints. The re-emergence of some of these groups and their victims don’t seem to be a coincidence. Some observers might even see the return of these big targeted attacks as the end of some sort of tacit agreement. We also observed several attacks against journalists, activists, political dissidents and NGOs around the world. Many of these attacks involved malware developed by companies that provide surveillance tools to governments. For instance, NSO and its Pegasus malware was discovered in more than 43 countries according to an external investigation, showing that business in this field is blooming. On a darker note, there were reports on how Saudi dissidents and Amnesty International volunteers were targeted with this malware. The Tibetan community was also specifically targeted with different malware families, including a Linux backdoor, PowerShell payloads, and fake social media to steal credentials. Finally, CitizenLab provided details of a campaign where Sandvine and GammaGroup artifacts were used for surveillance through local ISPs in Egypt, Turkey and Syria. This is clearly a new strategy, adopted as a defense mechanism and as a response to the attackers, in some cases being justice able to claim individual working for APT groups. This can later be used in diplomatic offensives and lead to tougher consequences at the state level. It seems that governments are no longer shy of making these attacks public and providing details of their investigations, while pointing fingers at the suspected attackers. This is an interesting development and we will see how it evolves in the future. The end of the Obama-era cyber-agreement between the US and China could be the reason for the wave of Chinese-speaking groups making a comeback, as well as the targeting of some of the high-profile ‘big fishes’ described above. We saw how in this new period of hostility between the two countries, the US obtained the extradition from Belgium of a Chinese intelligence officer charged with conspiring and attempting to commit economic espionage and steal trade secrets from multiple US aviation and aerospace companies. The US also provided details about a North Korean citizen suspected of being part of the Lazarus group that was behind the Sony Entertainment attack and WannaCry activity, and who is now wanted by the FBI. Maybe in an unrelated note, the US Cert was very active during the year in providing indicators of compromise and detailing Lazarus (HiddenCobra) activity and the tools used by this actor. After the infamous DNC hack, the US indicted 12 Russian citizens belonging to units 26165 and 74455 of the Russian Main Intelligence Directorate. Seven officers of GRU were also indicted for their alleged role in a campaign to retaliate against the World Anti-Doping Agency that exposed the Russian state-sponsored doping program. In Europe, UK Officials and the UK National Cyber Security Center attributed the not-Petya attack that took place in June 2017 to Russian military units. Finally, and in a very interesting initiative, the US Cyber Command launched an ‘information warfare’ campaign with a message to Russian operatives not to even try influencing the US mid-term election process. All the above, and several other cases, shows how there seems to be a new doctrine in dealing with such hacking attempts, making them public and providing tools for media campaigns, future negotiations and diplomacy, as well as directly targeting operatives. The closer malware gets to the hardware level, the more difficult it is to detect and delete. This is no easy task for the attackers, as it’s usually difficult to find the exploit chain to get that deep in the system, along with the difficulty in developing reliable malware working in such deep levels. That always raises the question of whether this malware already exists, quietly abusing modern CPU architecture characteristics, and we simply don’t see it. Recent discoveries of vulnerabilities in different processors open the door to exploits that might be around for years, because replacing the CPU is not something that can be easily done. It is not clear yet how Meltdown/Specter and AMDFlaws among others might be exploited and abused in the future, but attackers don’t really need to rush as these vulnerabilities will probably be around for a long time. Even if we haven’t see them being exploited in the wild yet, we believe this is a very valuable piece of knowledge for attackers and maybe also a timely reminder for us all about how important hardware security is. That leads on to something we actually saw in the VPNFilter attack, in this case targeting networking devices on a massive scale. This campaign, attributed to a Russian-speaking set of activity, allowed attackers to infect hundreds of thousands of devices, providing control of the network traffic as well as allowing MITM attacks. We saw APT actors abusing network devices in the past but never in such an aggressive way. Triton/Trisis is an industrial-targeting set of activity that gained popularity during the year as it was discovered in some victims, and is suspected of shutting down an oil refinery in an attack where the actor used a 0-day. According to FireEye, this actor might have Russian origins. In our predictions we already discussed the possibility of destructive attacks becoming normal in situations where tensions exist between two adversaries, using collateral victims to cause harm and send messages in this dangerous grey zone between an open attack and diplomacy. The past year has been extremely eventful in terms of the digital threats faced by financial institutions: cybercrime groups have used new infiltration techniques, and the geography of attacks has become more extensive. Despite this, let’s start the review with a positive trend: in 2018 police arrested a number of well-known cybercrime group members responsible for Carbanak/Cobalt and Fin7, among others. These groups have been involved in attacks on dozens, if not hundreds of companies and financial institutions around the world. Unfortunately, the arrest of group members including the leader of Carbanak, did not lead to a complete halt in activities – in fact, it seemingly started the process of splitting the groups into smaller cells. The most active actor of 2018 was Lazarus. This group is gradually expanding its arsenal of tools and looking for new targets. The area of interest today includes banks, fin-tech companies, crypto-exchanges, PoS terminals, ATMs, and in terms of geography, we have recorded infection attempts in dozens of countries, most of which are located in Asia, Africa and Latin America. At the end of last year, we noted that young fin-tech companies and crypto-exchanges are at a higher risk, due to the immaturity of their security systems. This certain type of companies was targeted most often. The most creative attack seen in 2018, from our point of view, was AppleJeus, which targeted cryptocurrency traders. In this case, criminals created special software that looked legitimate and carried out legitimate functions. However, the program also uploaded a malicious update that turned out to be a backdoor. This is a new type of attack, which infects its targets via the supply chain. Continuing the topic of supply chain attacks, it is worth mentioning the MageCart group, which, by infecting website payment pages (including those of large companies such as British Airways) was able to access a huge amount of payment card data this year. This attack was even more effective because the criminals chose an interesting target – Magento, which is one of the most popular platforms for online stores. Using vulnerabilities in Magento, criminals were able to infect dozens of sites in a technique that is likely to be used by several other groups. We should also note the development of ATM malware families. In 2018, Kaspersky Lab specialists discovered six new families, meaning that there are now more than 20 of this kind. Some ATM malware families have also evolved: for example, the Plotus malware from Latin America has been updated to a new version, Peralda, and has gained new functionality as a result. The greatest damage associated with attacks on ATMs was caused by infections from internal banking networks, such as FASTCash and ATMJackPot, which allowed attackers to reach thousands of ATMs. 2018 also saw attacks on organizations that use banking systems. Firstly, our machine learning-based behavioral analysis system detected several waves of malicious activity related to the spread of the Buhtrap banking Trojan this year, as attackers embedded their code in popular news sites and forums. Secondly, we detected attacks on the financial departments of industrial companies, where payments of hundreds of thousands of dollars would not cause much suspicion. Often in the final stages of attacks like this, attackers install remote administration tools on infected computers such as RMS, TeamViewer, and VNC. Attacks made through the underlying blockchain technologies of financial systems implemented by the financial institutions themselves – this did not happen in the financial field, but was seen in the online casino sector. ATM malware automation – yes. For example, there are malicious programs that immediately give money to attackers. The inclusion of fin-techs and mobile-only users in attacks: a fall in the number of traditional PC-oriented internet banking Trojans, with novice mobile banking users becoming the new prime target for criminals – yes. In particular, some banking Trojans stopped attacking users of online banking on PCs, while the number of Trojans attacking users of mobile devices has more than doubled over the past year. The arrest of leaders and separate members of major cybercrime groups has not stopped these groups from attacking financial institutions. Next year, we will most likely see the fragmentation of these groups and the creation of new ones by former members, which will lead to the intensification of attacks and the expansion of the geography of potential victims. At the same time, local groups will expand their activities, increasing quality and scale. It is reasonable to assume that some members of the regional groups may contact former members of the Win7 or Cobalt group to facilitate access to regional targets and gain new tools with which they can carry out attacks. Biometric systems for user identification and authentication are being gradually implemented by various financial institutions, and several major leaks of biometric data have already occurred. These two facts lay the foundation for the first POC (proof-of-concept) attacks on financial services using leaked biometric data. The activity of cybercriminals in these regions is constantly growing: the immaturity of protective solutions in the financial sector and the rapid spread of various electronic means of payment among the population and companies in these regions are contributing to this. Now, all the prerequisites exist for the emergence of a new center for financial threats in Asia, in addition to the three already in Latin America, Korean peninsula and the ex-USSR. This trend will remain with us in 2019. Attacks on software providers have proven effective and allowed attackers to gain access to several major targets. Small companies (that supply specialized financial services for the larger players) will be jeopardized first, such as the suppliers of money transfer systems, banks and exchanges. Next year, in terms of threats to ordinary users and stores, those who use cards without chips and do not use two-factor authorization of transactions will be the most at risk. The malicious community has focused on some simple goals that are easy to monetize. However, this does not mean that they do not use any complex techniques. For example, to bypass anti-fraud systems, they copy all computer and browser system settings. On the other hand, this cybercriminal behavior will mean that the number of attacks on PoS terminals will decrease, and they will move towards attacks on online payment platforms instead. Due to the lack of physical security and the lack of control over connected devices in many networks, cybercriminals will more actively exploit situations where a computer or mini-board can be installed, specifically configured to steal data from the network and transfer the information using 4G/LTE modems. Attacks like this will provide cybergangs with an opportunity to access various data, including information about the customers of financial institutions, as well as the network infrastructure of financial institutions. Mobile applications for business are gaining popularity, which is likely to lead to the first attacks on their users. There are enough tools for this, and the possible losses that businesses incur are much higher than the losses incurred when individuals are attacked. The most likely attack vectors are attacks at the Web API level and through the supply chain. Social engineering is particularly popular in some regions, for example Latin America. Cybercriminals keep targeting specific people in companies and financial institutions to make them wire big sums of money. Due to high amount of data leakages previous years this type of attacks becomes more effective, since criminals are able to use leaked internal information about targeted organization to make their messages look absolutely legit. Main idea remains the same: they make these targets believe that the financial request has come from business partners or directors. These techniques use zero malware, but demonstrate how targeted social engineering gets results and will become more powerful in 2019. This includes attacks like “simswap”. 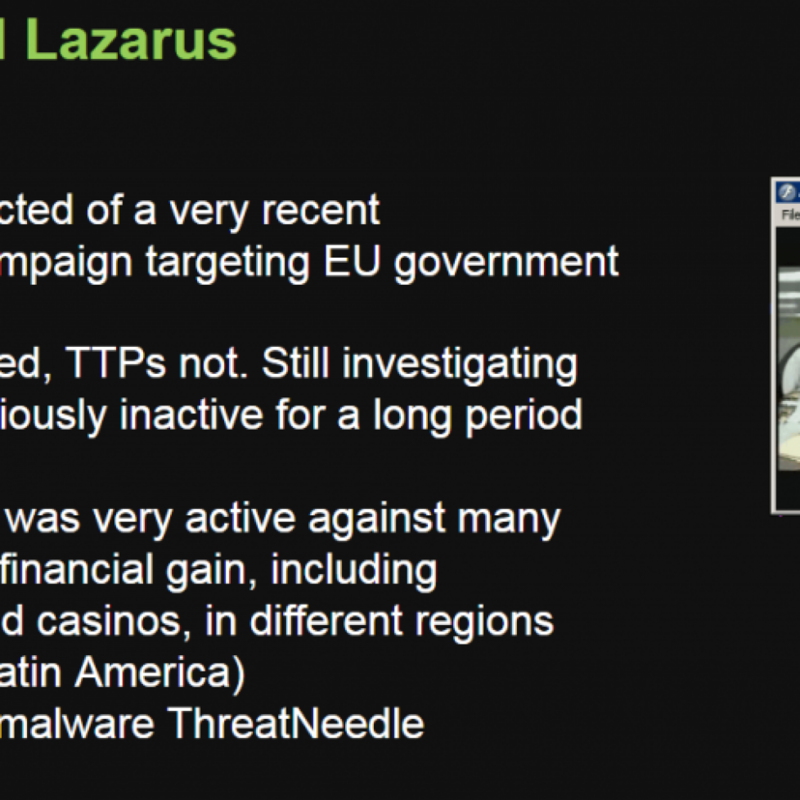 Lazarus has been a major threat actor in the APT arena for several years. Alongside goals like cyberespionage and cybersabotage, the attacker has been targeting banks and other financial companies around the globe. Over the last few months, Lazarus has successfully compromised several banks and infiltrated a number of global cryptocurrency exchanges and fintech companies. Kaspersky Lab has been assisting with incident response efforts. While investigating a cryptocurrency exchange attacked by Lazarus, we made an unexpected discovery. The victim had been infected with the help of a trojanized cryptocurrency trading application, which had been recommended to the company over email. It turned out that an unsuspecting employee of the company had willingly downloaded a third-party application from a legitimate looking website and their computer had been infected with malware known as Fallchill, an old tool that Lazarus has recently switched back to. There have been multiple reports on the reappearance of Fallchill, including one from US-CERT. To ensure that the OS platform was not an obstacle to infecting targets, it seems the attackers went the extra mile and developed malware for other platforms, including for macOS. A version for Linux is apparently coming soon, according to the website. It’s probably the first time we see this APT group using malware for macOS. The fact that the Lazarus group has expanded its list of targeted operating systems should be a wake-up call for users of non-Windows platforms. Thanks to Kaspersky Lab’s malicious-behavior detection technology, implemented in its endpoint security software, we were able to reassemble the stages of infection and trace them back to their origin. This helped us understand that one of Lazarus’ victims was infected with malware after installing a cryptocurrency trading program. We also confirmed that the user installed this program via a download link delivered over email. Including malicious code into distributed software and putting that on a website would be too obvious. Instead, the attackers went for a more elaborate scheme: the trojan code was pushed out in the form of an update for a trading application. A legitimate-looking application called Celas Trade Pro from Celas Limited showed no signs of malicious behaviour and looked genuine. 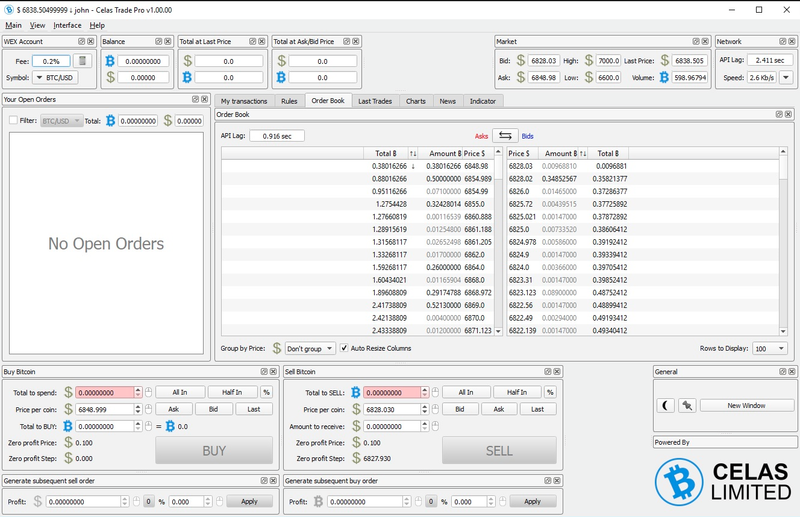 This application is an all-in-one style cryptocurrency trading program developed by Celas. When we started this research, any user could download the trading application from the Celas website. Checking the installation package downloaded from the website confirmed the presence of a very suspicious updater. At the end of the installation process, the installer immediately runs the Updater.exe module with the “CheckUpdate” parameter. This file looks like a regular tool and most likely will not arouse the suspicion of system administrators. After all, it even contains a valid digital signature, which belongs to the same vendor. But the devil is in the detail, as usual. The code writer developed this project under the codename “jeus”, which was discovered in a PDB path included in the updater and used as unique HTTP multipart message data separator string. Because of this, and the fact that the attacked platforms include Apple macOS, we decided to call this Operation AppleJeus. The main purpose of Updater.exe is to collect the victim’s host information and send it back to the server. Upon launch, the malware creates a unique string with the format string template “%09d-%05d” based on random values, which is used as a unique identifier of the infected host. This malware collects process lists, excluding “[System Process]” and “System” processes and gets the exact OS version from the registry value at “HKLM\SOFTWARE\Microsoft\Windows NT\CurrentVersion”. It seems that such values only exist from Windows 10, so we assume that the author developed and tested it on Windows 10. The code encrypts the collected information with the hardcoded XOR key (“Moz&Wie;#t/6T!2y“) before uploading it to the server. The server is a legitimate looking website owned by the developer of the program: Celas LLC. At this point we were not able to conclude with high confidence whether the server was compromised by the threat actor or had belonged to the threat actor from the beginning. To learn more about the server, please read the “Infrastructure” section below. The malware used a hardcoded User-Agent string “Mozilla/5.0 (compatible; MSIE 10.0; Windows NT 6.1; Trident/6.0)” and fixed a multipart form data separator string “jeus“. Using encryption, the custom separator string wouldn’t be a red flag for a legitimate application, but sending a request with the context-irrelevant string “get_config”, as well as uploading collected system information as “temp.gif”, mimicking a GIF image with a magic number in the header, definitely made us raise our eyebrows. After successfully uploading data, the updater checks the server response. If the server responds with HTTP code 300, it means the updater should keep quiet and take no action. However, if the response is HTTP code 200, it extracts the payload with base64 and decrypts it using RC4 with another hardcoded key (“W29ab@ad%Df324V$Yd“). The decrypted data is an executable file that is prepended with the “MAX_PATHjeusD” string. During our research, we found other similar files. One was created on August 3rd and another on August 11th. The PDB path shows that the author keeps improving this updater tool, apparently forked from some stable version released on July 2, 2018 according to the internal directory name. Note the TManager directory in the PDB path from the table. It will pop up again in another unexpected place later. 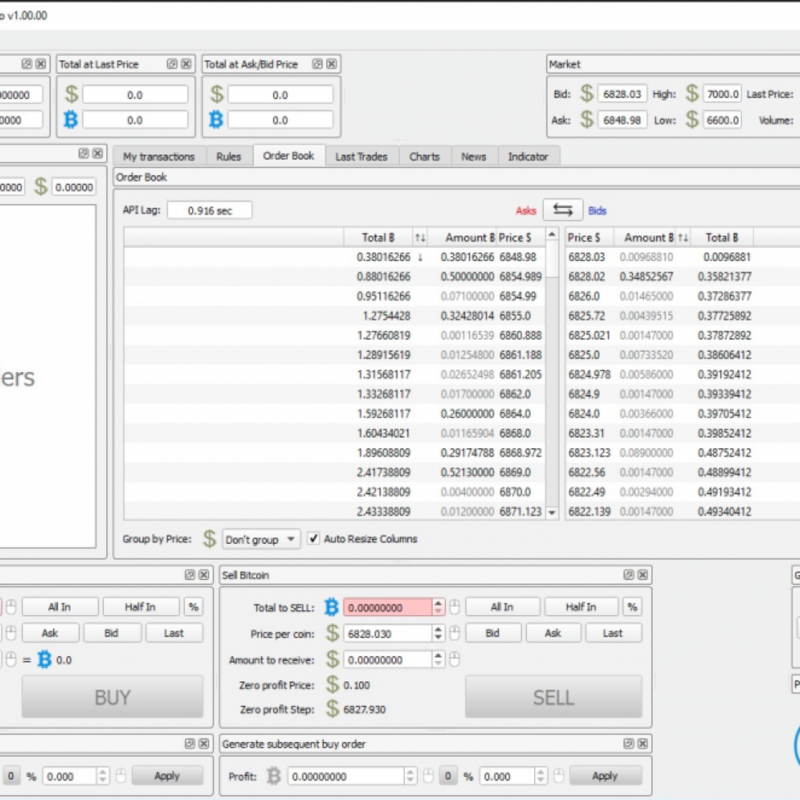 For macOS users, Celas LLC also provided a native version of its trading app. A hidden “autoupdater” module is installed in the background to start immediately after installation, and after each system reboot. It keeps contacting the command and control (C2) server in order to download and run an additional executable from the server. The communication conforms to the Windows version of the updater and is disguised as an image file upload and download, while carrying encrypted data inside. Once the Cellas Trade Pro app is installed on macOS, it starts the Updater application on the system load via a file named “.com.celastradepro.plist” (note that it starts with a dot symbol, which makes it unlisted in the Finder app or default Terminal directory listing). The “Updater” file is passed the “CheckUpdate” parameter on start. The command-line argument “CheckUpdate” looks redundant from a code analysis perspective: there is no other argument that the application expects. In the absence of all arguments, it doesn’t do anything and quits. This may or may not be way to trick sandboxes that could automatically execute this trojan updater, with no suspicious activity produced without such a “secret” extra argument. The choice of a benign string such as “CheckUpdate” helps it to hide in plain sight of any user or administrator looking into running processes. Once the server replies, it checks the HTTP response code. HTTP response code 300 indicates that the server has no task for the updater and the application terminates immediately. If the HTTP response is code 200, then the updater gets the data in the response, decodes it from base64 encoding and decrypts it using RC4 with the hardcoded static key “W29ab@ad%Df324V$Yd“. It calculates the MD5 of the decoded and decrypted data, which is compared to a value stored inside, to verify the integrity of the transferred file. After that, the payload is extracted and saved to a hardcoded file location “/var/zdiffsec“, sets executable permissions for all users and starts the app with another secret hardcoded command-line argument “bf6a0c760cc642“. Apparently the command-line argument is the way to prevent the detection of its malicious functionality via sandboxes or even reverse engineering. We have previously seen this technique adopted by Lazarus group in 2016 in attacks against banks. As of 2018, it is still using this in almost every attack we investigated. Note the unusually large size for an executable file. We believe that it was inflated with junk data on purpose to prevent easy download or transfer over the internet. This value includes a list of several dozen standard system service names. Check whether the command-line argument points to a file of 16 byte size. Read the file passed via the command-line argument. The contents of this file contains a crypto key, which we will call the main key. Open the msncf.dat file (configuration file). If the file size equals 192 bytes, read the content of the file. Open msndll.tmp file and decrypt it using the main key. Create the [service]svc.dll file and fill it with pseudo-random data. The malware fills the file with 10,240 bytes of pseudo-random data, and iterates (rand() % 10 + 10240) times. This is why it produces files which are at least 104,851,000 bytes. Copy the 16-byte main key at the end of the [service]svc.dll file. Encrypt the [service].dat file name with the main key and append it at the end of [service]svc.dll. Overwrite the beginning of [service]svc.dll with data decrypted from msndll.tmp. Move msndll.dat file to [service].dat. Delete temporary files: msndll.tmp, msncf.dat, msndll.log. Timestamp [service]svc.dll and [service].dat files. Register [service]svc.dll as a Windows service. Upon starting, uploadmgrsvc.dll reads 276 bytes from the end of its own executable file. The first 16 bytes of this 276-byte data are used as a decryption key, and the remaining 260 bytes contain the encrypted file path used by the backdoor. After decryption of the last 260-bytes, the malware retrieves the name or path of the file that contains the actual backdoor body in encrypted form. If there is no configuration value, the malware falls back to a default C2 server address. This is a full-featured backdoor that contains enough functions to fully control the infected host. Some of its network protocol commands are described below. 0x8043 Send “Not Service” unicode string to C2 server (communication test?). This set of capabilities is very common for many Lazarus backdoors, which have been seen in other attacks against banks and financial industry in the past years. While working on the incident of the cryptocurrency company’s breach, we were curious about the legal status of the Celas LLC company that developed this trojanized trading application. The website had a valid SSL certificate issued by Comodo CA. However, note that the certificate from this webserver mentions “Domain Control Validated”, which is a weak security verification level for a webserver. It does not mean validation of the identity of the website’s owner, nor of the actual existence of the business. When certification authorities issue this kind of certificate they only check that the owner has a certain control over the domain name, which can be abused in certain ways. Below is the WHOIS record of the “celasllc.com” domain. The domain name was registered by an individual named “John Broox” with registrant email address “johnbroox200@gmail[.]com”. It looks at first sight like a legitimate WHOIS record, but something doesn’t really add up here. The domain celasllc.com was the only domain registered with this email address and was exclusively used for domain registration. The registrant used the Domain4Bitcoins service to register this domain, apparently paying with cryptocurrency. According to open-source intelligence, the address of the WHOIS information is fake, unless it’s the owner of a ramen shop running a cryptocurrency exchange software development studio on the side. View of the location referred in the WHOIS record. Image source: Google Maps. The server hosting celasllc.com (185.142.236.213) belongs to the Blackhost ISP in the Netherlands. However, when you look into Celas Trading Pro application’s digital signature, including its “Updater”, you will find that this certificate was also issued by Comodo CA, which refers to a company address in the United States. 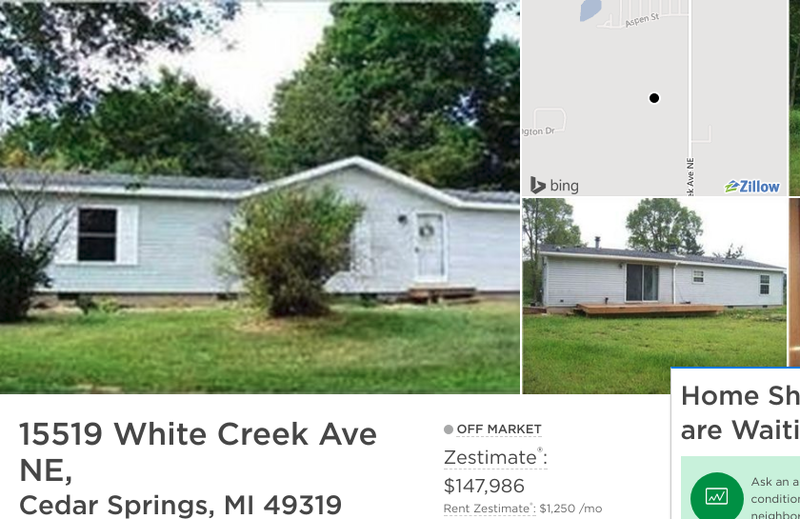 According to open-source data, this address doesn’t belong to a real business, and looks on maps like a meadow with a small forest and small real estate offering nearby. Pivoting the infrastructure a little further brings up some more suspicious things. It appears that the domain referred to two IPs, one of which was linked to a few other suspicious domains, according to PassiveDNS. The owners of the linked infrastructural elements preferred to use several interesting services for hosting domain registration. All these service providers offer a certain level of anonymity to their customers. Most of them accept Bitcoins as a main payment method to keep their customers anonymous. This is very uncommon for companies running a legitimate business. All the facts above can make the more sceptical among us doubt the intentions of Celas LLC and the legitimacy of this business. Of course, these facts alone would not be enough to accuse Celas LLC of committing a crime. Kaspersky Lab has previously attributed the Fallchill malware cluster to Lazarus group when it attacked the financial sector around the world. It was also confirmed by other security vendors, and the national CERT of US. Fallchill malware uses a RC4 algorithm with a 16-byte key to protect its communications. The key extracted from the Fallchill variant used in the current attack is DA E1 61 FF 0C 27 95 87 17 57 A4 D6 EA E3 82 2B. We were able to confirm that some of older Fallchill malware variants used exactly the same RC4 key. Below are Fallchill malware samples that used the same key (the compilation timestamp may indicate the date of malware creation). We have confirmed that the C2 server addresses (196.38.48[. ]121, 185.142.236[. ]226) used in this attack have been used by the older variant of Fallchill. Apparently, the attackers using the Fallchill malware continue to reuse code and C2 server infrastructure over and over again. Second, what is probably one of the most interesting findings to come from this additional backdoor was discovered hidden in hardcoded headers used to communicate with C2 server. The Accept-Language HTTP header string revealed a language code associated with North Korea. In our experience, this is something we normally don’t see in malware. The Lazarus APT group’s continuous attacks on the financial sector are not much of a surprise to anyone. A lot of research has been done and published about such attacks. However, we think this case makes a difference. Recent investigation shows how aggressive the group is and how its strategies may evolve in the future. First of all, Lazarus group has entered a new platform: macOS. There is steadily growing interest in macOS from ordinary users, especially in IT companies. Many developers and engineers are switching to using macOS. Apparently, in the chase after advanced users, software developers from supply chains and some high profile targets, threat actors are forced to have macOS malware tools. We believe that in the future Lazarus is going to support all platforms that software developers are using as a base platform, because compromising developers opens many doors at once. We cannot say with full certainty whether Celas LLC was compromised and the threat actor abused it to push malware through an update mechanism. However, the multiple successful Lazarus attempts to compromise supply chain companies suggest that it will keep exploring this infection method. From all angles, the Celas LLC story looks like the threat actor has found an elaborate way to create a legitimate looking business and inject a malicious payload into a “legitimate looking” software update mechanism. Sounds logical: if one cannot compromise a supply chain, why not to make fake one? This should be a lesson to all of us and a wake-up call to businesses relying on third-party software. Do not automatically trust the code running on your systems. Neither good looking website, nor solid company profile nor the digital certificates guarantee the absence of backdoors. Trust has to be earned and proven. Stay safe!